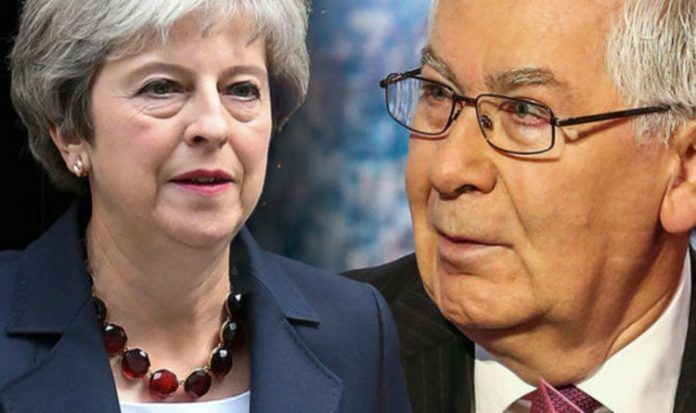 THERESA May’s Brexit push suffered another blow today when a former Bank of England governor condemned the handling of the EU negotiations as “incompetent”. In a scathing attack, Lord King said it “beggars belief” that the country appeared to be so ill-prepared for next year’s departure from the bloc. “Frankly, if a government cannot take action to prevent some of these catastrophic outcomes, whatever position you take on the EU, it illustrates a whole lack of preparation,” Lord King said in a BBC interview today. Lord King, who was in charge of the Bank of England from 2003 until 2013, said that credible plans should have been put in place to leave without a deal because Britain cannot impose a deal on the EU. He feared biggest risk to the UK was that the referendum had failed to resolve the issue of Brexit and it “isn’t going to go away”. Leading Tory Brexiteer Jacob Rees-Mogg echoed Lord King’s concerns. The MP, who is chairman of the 60-strong European Research Group of backbenchers, said: “I think he’s somebody that one would listen to very seriously. “He’s a very distinguished former governor and he has raised some important concerns about the lateness of the preparation for leaving on World Trade Organisation terms and the way the negotiations have been carried out.